جعفری, مختار. (1396). مسائل غامض و تناقضات اجرای خط‌مشی فرهنگی ناحیه‌ای: شیوه‌های حکمرانی، قدرت تصمیم‌گیری، نتیجه خط‌مشی. 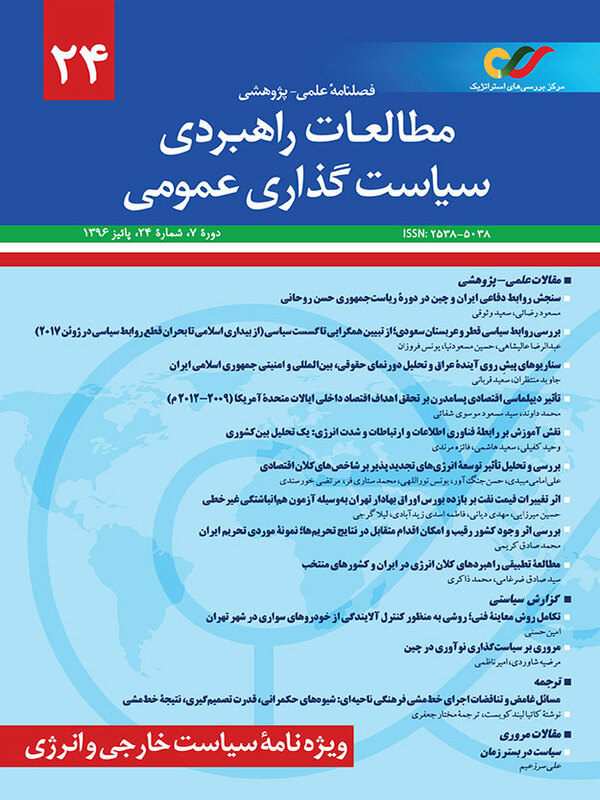 مطالعات راهبردی سیاستگذاری عمومی, 7(24), 249-277. مختار جعفری. "مسائل غامض و تناقضات اجرای خط‌مشی فرهنگی ناحیه‌ای: شیوه‌های حکمرانی، قدرت تصمیم‌گیری، نتیجه خط‌مشی". مطالعات راهبردی سیاستگذاری عمومی, 7, 24, 1396, 249-277. جعفری, مختار. (1396). 'مسائل غامض و تناقضات اجرای خط‌مشی فرهنگی ناحیه‌ای: شیوه‌های حکمرانی، قدرت تصمیم‌گیری، نتیجه خط‌مشی', مطالعات راهبردی سیاستگذاری عمومی, 7(24), pp. 249-277. جعفری, مختار. مسائل غامض و تناقضات اجرای خط‌مشی فرهنگی ناحیه‌ای: شیوه‌های حکمرانی، قدرت تصمیم‌گیری، نتیجه خط‌مشی. مطالعات راهبردی سیاستگذاری عمومی, 1396; 7(24): 249-277. طراحی اشتباه خط‌مشی بر خروجی خدمات عمومی و در سطح عملیاتی شرایط ارائۀ خدمات عمومی تأثیرگذار است. چندپارگی مدیریت عمومی که ناشی از اصلاحات حکومتی است به‌عنوان مسئله‌ای برای حکومت‌ها، عرضه‌کنندگان خدمات عمومی و شهروندان در شکست خط‌مشی پدیدار می‌شود. خروجی ضعیف خط‌مشی آموزشی موزه در سطح ناحیه‌ای نقطۀ شروع مطالعۀ تناقضات اجرای خط‌مشی فرهنگی ناحیه‌ای است. این مقاله جعبۀ سیاه اجرای خط‌مشی را گشوده و مغایرت‌های نهایی در خط‌مشی توسعۀ ناحیه‌ای، تضاد انتظارات میان ذی‌نفعان و در کنار آن، تناقضات حکومتی را که منجر به شکاف میان مفاهیم خط‌مشی، برونداد و نتیجه شده است شناسایی کرده است. Agranoff, R. (2007). Managing within networks: Adding value to public organizations. Washington, DC: Georgetown University Press. Ansell, C., & Gash, A. (2008). Collaborative governance in theory and practice. Journal of Public Administration Research and Theory, 18, 543-571. Bannink, D., & Ossewaarde, R. (2012). Decentralization: New modes of governance and administrative responsibility. Administration & Society, 44, 595-624. Bell, S., Hindmoor, A., & Mols, F. (2010). Persuasion as governance: A state-centric relational perspective. Public Administration, 88, 851-870. Bovens, M. (1998). The quest for responsibility: Accountability and citizenship in complex organizations. Cambridge, UK: Cambridge University Press. Bovens, M., & ‘t Hart, P. (1995). Frame multiplicity and policy fiascoes: Limits to explanation. Knowledge and Policy: The International Journal of Knowledge Transfer and Utilization, 8, 61-82. Bryson, J. M., Crosby, B. C., & Stone, M. M. (2006). The design and implementation of cross-sector collaborations: Propositions from the literature. Public Administration Review, 66(suppl. 1), 44-55. Christensen, T., Fimreite, L. A., & Lægreid, P. (2014). Joined-up government for welfare administration reform in Norway. Public Organization Review, 14, 439-456. Christopoulos, S., Horvath, B., & Kull, M. (2012). Advancing the governance of cross-sectoral policies for sustainable development: A metagovernance perspective. Public Administration and Development, 32, 305-323. Compston, H. (2009). Policy networks and policy change. Putting policy network theory to the test. Basingstoke, UK: Palgrave Macmillan. Cooke, P., & De Propris, L. (2011). A policy agenda for EU smart growth: The role of creative and cultural industries. Policy Studies, 32, 365-375. Downe, J., & Martin, S. (2006). Joined up policy in practice? The coherence and impacts of the local government modernisation agenda. Local Government Studies, 32, 465-488. Dugan, R. E., & Hernon, P. (2002). Outcomes assessment: Not synonymous with inputs and outputs. The Journal of Academic Librarianship, 28, 376-380. Elmore, R. (1980). Backward mapping: Implementation research and policy decisions. Political Science Quarterly, 94, 601-616. Emerson, K., Nabatchi, T., & Balogh, S. (2012). An integrative framework for collaborative governance. Journal of Public Administration Research & Theory, 22, 1-29. Ethridge, M., & Percy, S. (1993). A new kind of public policy encounters disappointing results: Implementing Learnfare in Wisconsin. Public Administration Review, 53, 340-347. Fawcett, P., & Daugbjerg, C. (2012). Explaining governance outcomes: Epistemology, network governance, and the policy network analysis school. Political Studies Review, 10, 195-207. Geddes, L. (2012). In search of collaborative public management. The prolific and other priority offender programme. Public Management Review, 14, 947-966. Grodach, C. (2012). Before and after the creative city: The politics of urban cultural policy in Austin, Texas. Journal of Urban Affairs, 34, 81-97. Head, B. W. (2008). Assessing network-based collaborations. Public Management Review, 10, 733-749. Héritier, A., & Lehmkuhl, D. (2008). The shadow of hierarchy and new modes of governance. Journal of Public Policy, 28, 1-17. Hill, C., & Lynn, L. (2005). Is hierarchical governance in decline? Evidence from empirical research. Journal of Public Administration Research and Theory, 15, 173-195. Hill, M., & Hupe, P. (2002). Implementing public policy: Governance in theory and in practice. London, England: SAGE. Hjern, B., & Porter, D. (1981). Implementing structures: A new unit of administrative analysis. Organization Studies, 2, 211-227. Howlett, M., Ramesh, M., & Perl, A. (1995). Studying public policy: Policy cycles and policy subsystems. Toronto, Ontario, Canada: Oxford University Press. Hupe, P. (2011). The thesis of incongruent implementation: Revisiting Pressman and Wildavsky. Public Policy and Administration, 26, 63-80. Hupe, P., & Hill, M. (2006). The three action levels of governance: Re-framing the policy process beyond the stages model. In B. G. Peters & J. Pierre (Eds. ), Handbook of public policy (pp. 13-28). London, England: SAGE. Hupe, P., & Hill, M. (2007). Street-level bureaucracy and public accountability. Public Administration, 85, 279-299. Hupe, P., Hill, M., & Nangia, M. (2014). Studying implementation beyond deficit analysis: The top-down view reconsidered. Public Policy and Administration, 29, 145-163. Huxham, C. (2000). The challenge of collaborative governance. Public Management, 2, 337-357. Jessop, B. (2003). Governance and metagovernance: On reflexivity, requisite variety and requisite irony. In H. P. Bang (Ed. ), Governance as social and political communication (pp. 101-116). Manchester, UK: Manchester University Press. Kalu, K. N. (2012). All that glitters: Competing narratives and transaction costs in complex collaborative environments. Administration & Society, 45, 420-442. Kapucu, N., Hu, Q., & Khosa, S. (2014). The state of network research in public administration. Administration & Society. Advance online publication. Doi:10.1177/0095399714555752. Klijn, E.-H. (2002). Governing networks in the hollow state: Contracting out, process management or a combination of the two? Public Management Review, 4, 149-165. Klijn, E.-H., & Koppenjan, J. F. M. (2000). Management and policy networks: Foundations of a network approach to governance. Public Management, 2, 135-158. Koning, P., & Heinrich, C. J. (2013). Cream-skimming, parking and other intended and unintended effects of high-powered, performance-based contracts. Journal of Policy Analysis and Management, 32, 461-483. Kooiman, J. (1999). Social-political governance: Overview, reflections and design. Public Management, 1, 67-92. Kulturnämnden, Region Skåne. (2006). Uppdragsöverenskommelse om pedagogisk verksamhet mellan Region Skåne genom Kultur Skåne och [ . . . ] Museum. KU/06. [Commission agreement between Region Skåne and an anonymized museum]. Landskrona, Sweden: Region Skåne. Kulturnämnden, Region Skåne. (2007). Region Skånes kulturpedagogiska verksamhet. Dnr KU/070091. [Document presenting the museum and gallery educational activities commissioned by Region Skåne]. Landskrona, Sweden: Kulturnämnden, Region Skåne. Kulturnämnden, Region Skåne. (2009). Uppdragsöverenskommelse mellan Region Skåne och […] Museum angående kulturpedagogik. Dnr. 0900762. [Commission agreement between Region Skåne and an anonymized museum]. Landskrona, Sweden: Kulturnämnden, Region Skåne. Kulturnämnden, Region Skåne. (2012). Kulturnämnden: Budget och verksamhetsplan 2013. Beslutad 2012-12-13 och 2013-02-06 [Budget and annual plan for 2013 for and approved by the Board of Cultural Affairs of the Region of Skåne]. Malmö, Sweden: Region Skåne. Kultur Skåne. (2011). Direktiv – Utvärdering av Region Skånes kulturpedagogiska verksamhet. Dnr 1000462 [Instructions for commission of an evaluation of regional museum education policy in Skåne]. Malmö, Sweden: Kultur Skåne. Lægreid, P., & Verhoest, K. (2010). Governance of public sector organizations: Proliferation, autonomy and performance. Basingstoke, UK: Palgrave Macmillan. Lasswell, H. D. (1956). The decision process: Seven categories of functional analysis. College Park: Bureau of Governmental Research, College of Business and Public Administration, University of Maryland. Lecy, J. D., Mergel, I. A., & Schmitz, H. P. (2014). Networks in public administration. Public Management Review, 16, 643-665. Lee, D., Hesmondhalgh, D., Oakley, K., & Nisbett, M. (2014). Regional creative industries policy-making under New Labour. Cultural Trends, 23, 217-231. Lindblom, C. E. (1959). The science of “muddling through.” Public Administration Review, 19, 79-88. Lindblom, C. E. (1979). Still muddling, not yet through. Public Administration Review, 39, 517-526. Lynn, L., & Robichau, R. (2013). Governance and organisational effectiveness: Towards a theory of government performance. Journal of Public Policy, 33, 201-228. Matland, R. (1995). Synthesizing the implementation literature: The ambiguityconflict model of policy implementation. Journal of Public Administration Research and Theory, 5, 145-174. McCallion, S. M. (2008). Tidying up? “EU”ropean regionalization and the Swedish “Regional mess.” Regional Studies, 42, 579-592. McGuire, M. (2006). Collaborative public management: Assessing what we know and how we know it. Public Administration Review, 66 (Suppl. 1), 33-43. Moeran, B., & Alačovska, A. (2011). Creative industries: Critical readings. London, England: Berg. Moon, J. (2001). Cultural governance: A comparative study of three cultural districts. Administration & Society, 33, 432-454. O’Brien, D., & Miles, S. (2010). Cultural policy as rhetoric and reality: A comparative analysis of policy making in the peripheral north of England. Cultural Trends, 19, 3-13. Perrons, D., & Dunford, R. (2013). Regional development, equality and gender: Moving towards more inclusive and socially sustainable measures. Economic and Industrial Democracy, 34, 483-499. Peters, B. G. (2014). Implementation structures as institutions. Public Policy and Administration, 29, 131-144. Pike, A., Rodríguez-Pose, A., & Tomaney, J. (2006). Local and regional development. Abingdon, UK: Routledge. Pollitt, C., & Bouckaert, G. (2000). Public management reform: A comparative analysis. Oxford, UK: Oxford University Press. Rodríguez, C., Langley, A., Béland, F., & Denis, J.-L. (2007). Governance, power, and mandated collaboration in an interorganizational network. Administration & Society, 39, 150-193. Sabatier, P., & Weible, C. (2014). Theories of the policy process (3rd ed.). Boulder, CO: Westview Press. Schout, A. (2011). Assessing the added value of an EU agency for aviation safety. Journal of Public Policy, 31, 363-384. Sørensen, E. (2007). Public administration as metagovernance. In G. Gjelstrup & E. Sørensen (Eds. ), Public administration in transition: Theory, practice, methodology (pp. 107-126). Copenhagen, Denmark: DJØF Publishing (Company of the Association of Danish Lawyers and Economists). Tafel-Viia, K., Viia, A., Terk, E., & Lassur, S. (2014). Urban policies for the creative industries: A European comparison. European Planning Studies, 22, 796-815. Taylor, C. (2015). Between culture, policy and industry: Modalities of intermediation in the creative economy. Regional Studies, 49, 362-373. Toens, K., & Landwehr, C. (2009). The uncertain potential of policy-learning: A comparative assessment of three varieties. Policy Studies, 30, 347-363. Tolkki, H., Haveri, A., Airaksinen, J., & Valkonen, E. (2011). Governance in regional development—Between regulation and self-regulation. Public Organization Review, 11, 313-333. Torfing, J., Peters, B. G., Pierre, J., & Sørensen, E. (2012). Interactive governance: Advancing the paradigm. Oxford, UK: Oxford University Press. Yin, R. (2009). Case study research: Design and methods (4th ed.). London, England:SAGE.